Jazz Station - Arnaldo DeSouteiro's Blog (Jazz, Bossa & Beyond): Crossover CD of the Month - "Chick Corea: The Continents"
Crossover CD of the Month - "Chick Corea: The Continents"
Making music for a combination of orchestral musicians and jazz musicians has endless possibilities. Appreciation for the abilities each has for the other makes for an atmosphere charged with high interest, creative communication and new ideas. This was the setting for the composing and recording of The Continents for me, a dream come true. The process of making the recording was magical. The morale of the musicians plus the recording team was so high that we finished recording the six move-ments of the concerto a day and a half under schedule. After saying goodbyes to the orchestra musicians, the Quintet had an impromptu jam just for fun. Of course, the recorder was on. I then had the next evening to record some piano solo bits that I thought would fit the cadenza sections of the concerto. After recording those, I felt there was still something incomplete about The Continents recording. So I decided to try to get to what it was by improvising on the piano by myself I felt that the basic material was somehow lacking something was missing. That last evening, while I was waiting for Bernie to set things up and turn on the re-corder, I played the piano, starting my exploration to find what was missing. As you will hear, after playing several little pieces, I asked Bernie if he was ready to record to which Bernie answered that he had been recording all the time but didn t want to interrupt me. So we continued recording from there until I felt I was finished. 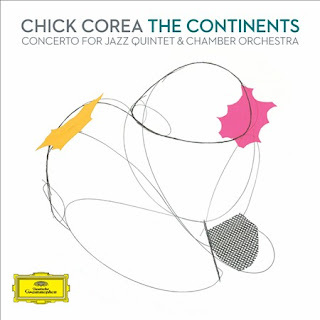 After listening to the Quintet s jam and the piano soliloquies, I now feel that the recording of The Continents is complete (at least for the moment). The music may have its technical flaws, as perfection was never the goal but I m pleased that the music was made in the Spirit Of Play, which was the initial intent of the composition after being invited to write a piano concerto in the spirit of Mozart by the Wiener Mozartjahr. As it took this great team to make it happen, my heartfelt thanks go to: Bill Rooney for helping me realize this concerto by managing my ideas through to realities. Tim Garland, Marcus Gilmore, Hans Glawischnig and Steve Davis for their friendship and brilliant performances. Fred Sherry for helping me assemble the perfect set of musicians for this project. And to Steve Mercurio for his warmth and care in helping me bring the details of my score into focus. The Harlem String Quartet and Imani Winds for bringing their uplifting spirit to this music. And to Richard Stoltzman for his encouragement and transcendent clarinet sound. All the musicians of the orchestra for their high-spirited performances. Steve Epstein for his expert handling of the complexities of the sonic environment - and the recording and editing aspects of this project. Bernie Kirsh for his friendship and artistic recording - and Todd Whitelock for his masterful editing and mixing. My personal thanks to my wife Gayle Moran Corea for her love and support. And to L. Ron Hubbard for being a continual source of inspiration.